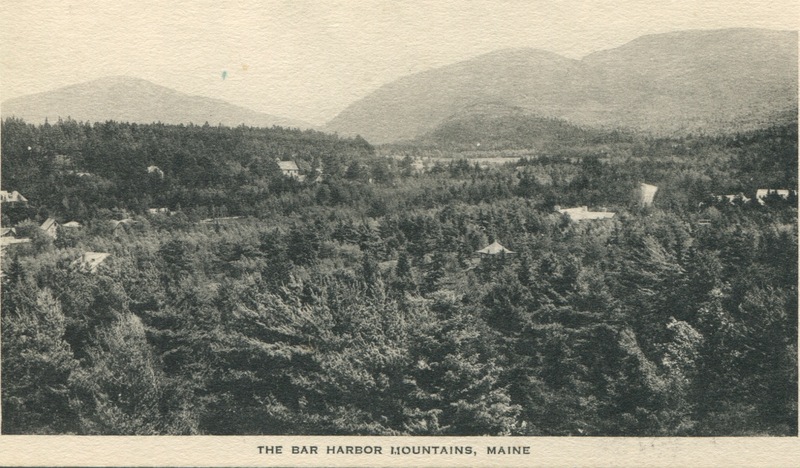 The Bar Harbor Village Improvement Association was the first of its kind organized on Mount Desert Island, in the Town of Eden, in the summer of 1881. Later in the 1890’s, similar societies were established in the Town of Mount Desert in the villages of Northeast Harbor, Seal Harbor and yet later in other island villages. 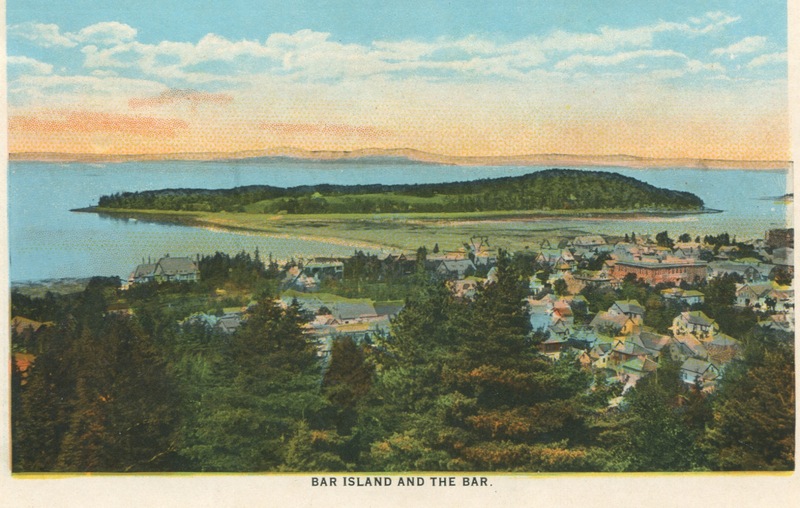 These societies appear to be unique to Mount Desert Island. Reported in the Association’s First Annual Report of 1890, that is was at the suggestion of a distinguished and public spirited citizen of New York, (Mr. Morris K. Jesup), that “this society was organized to carry out such work of amelioration and adornment, as might from time to time be suggested to science and good taste, in order to bring the village itself into a greater conformity with its beautiful environment.” Mrs. Charles Dorr (mother of George Dorr) is also recognized and credited with the formal establishment of the VIA. Other charter members included the Association’s first elected officers, Parke Godwin, William Sherman (Eden’s town Clerk), Fred C. Lynam (first-elected and longest serving officer), Dr. Robert Amory, Morris Jesup, and Hon. Luere B. Deasy. Many other local and summer residents served on the Association’s Board of Managers, such as E.T. Hamor, Serenus Rodick, Charles T. How, Augustus Gurnee, Mary Dorr, and George Vanderbilt. Early reports reflected the members’ far-reaching concerns. 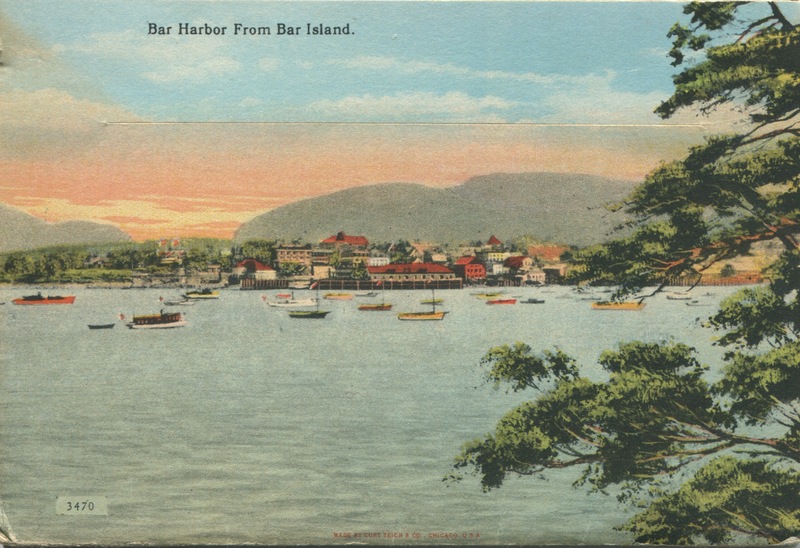 Included in the Association’s Annual Reports were updates from committees on Sewers, Roads, Sidewalks and Wood Paths, the Waterfront, the Water and Milk Supply, Trees, Fire Escapes at local hotels, a proposed police station and lock-up, and a troublesome area known as “Squaw Hollow” on the shores of Cromwell Harbor Brook. The Third Annual Report reports the Association passed a resolution that the committee communicate and advise the Town Selectmen of the unsanitary and threatening condition of the possibility of cholera from “Squaw Hollow”, suggesting the only safe way to deal with these conditions was to empty the place of its inhabitants and have the whole neighborhood disinfected. Extensive committee reports on the sewers of the Town included the locations of, and relocating of, stables within the village. Before the strong central organization of town government, that we know today, and before the town changed its name to Bar Harbor, the VIA took on the responsibility each summer of street cleaning. The VIA provided wooden rubbish barrels and public settees from Corniche Drive along the bluffs, to village streets and Ocean Drive. In addition to street cleaning, many of the town’s roads were improved, including the Ocean Drive and Otter Cliffs Road. Wood paths, all inclusive on the eastern side of the island, were cleared of fallen trees and kept in passable order for the many summer sojourners by the VIA. The responsibility for the many miles of roads and trails was delegated to one of the Association’s foremost committees, that of Roads and Paths, first chaired by George B. Dorr. The Roads and Paths Committee, which reported annually till 1941, was served by an illustrious group of gentlemen through the years: Waldron Bates (credited with design of the island-wide network that connected trails of eastern paths to the southern group of trails supported by the other Village Improvement Societies of Seal Harbor and Northeast Harbor), Professor Brunnow (whose vision created the spectacular Precipice Trail), among others. This committee was also charged with the building of several memorial trails, and created maps for resale. The Sanitary Committee consisted of all medical practitioners of the town and was first headed by renowned New York surgeon Dr. Robert Abbe. This committee reported on the water and milk supply to Bar Harbor. Among the influential recommendations proposed by the committee was the establishment of a Board of Health and a health officer to enforce sanitary regulations, and the allocation of monies for the building and operation of a hospital (1897). A special committee appointed in the summer of 1892, the Village Clock Committee, wrestled with the contentious issue of where the clock should be placed. Finally, in the summer of 1896, a village clock purchased by the Association for the sum of $1250 from the renowned clockmaker, E. Howard & Co. of Boston, with tower, was placed in front of Bee’s on Main Street – only after obtaining permission from Mr. Albert Bee. 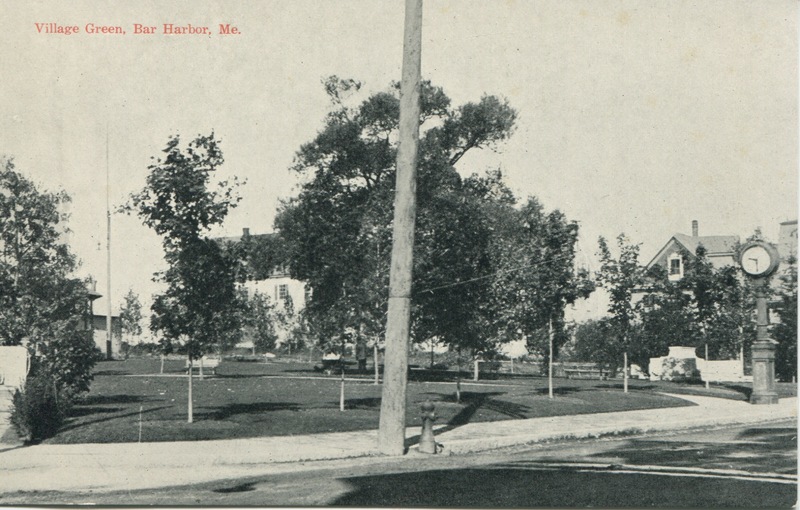 Later in 1904, the Association approached the Town Selectmen to lease the empty “town lot” located on the corner of Main and Mount Desert Street for the purpose of building and landscaping a village green. The “town lot” had been the site of the Grand Central Hotel which was razed in the winter of 1899, leaving an unsightly hole in the ground with cellar walls. The town meeting had turned down the proposal that a Town Hall be built there. 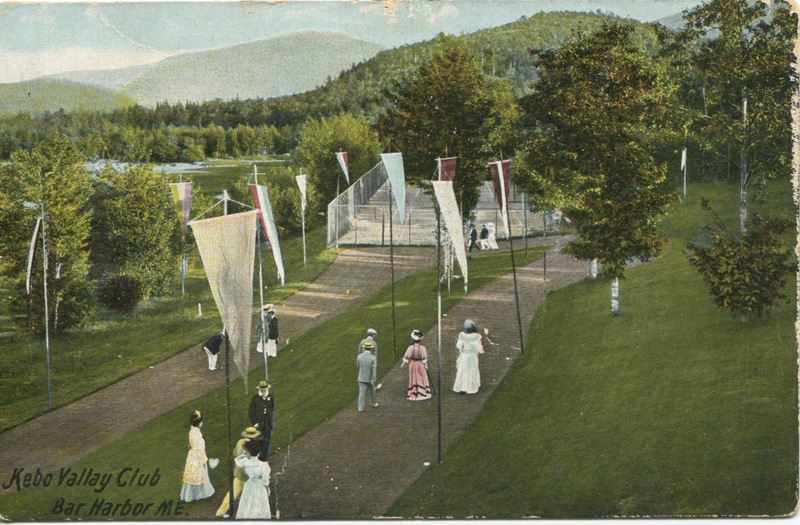 The VIA lease of the Village Green remained in effect through the 1920’s when a new generation of VIA members thought the Town should be maintaining upkeep while the Association got back to the basics of “improvements.” The new generation produced and commissioned long-range plans for the adornment of village streets, the Village Green by Beatrix Farrand, and island-wide surveys by Dr. Charles Eliot. When the first lease was negotiated by the VIA, the Town Selectmen suggested that the clock be removed from Main Street’s narrow sidewalk to the proposed village square at the Association’s expense, since the Association owned the clock. Again, the placement of the clock sparked controversy as to which direction it would face and about its location in the square. President Parke Godwin appointed George Dorr’s committee to resolve this on-going controversy. In his eight page Report of the VIA Committee on the Village Green, he suggested widening the sidewalk along Main Street for the relocation of the clock and that it face North/South so as to provide the best visibility from both ends of the street. The report was accepted and its proposals approved by the Association, and the clock found its present location. Another controversial committee was appointed the next year regarding the restriction of the automobile in Bar Harbor. The Association voted to secure the cooperation of its sister societies on MDI to adopt a similar manifesto excluding automobiles from the whole island. Efforts for a joint committee of island societies was formed to address this most important issue. The automobile issue left summer residents and local residents on different sides. Later, after the automobile issue was resolved in the State’s Supreme Court, and automobiles were allowed in all island communities, general complaints persisted on the speeding of automobiles on island roads. As late as 1926, the Association hired extra police duty to enforce the 15 MPH limit along Ocean Drive. By 1919, the Association had grown to include 400 members. In the 1919 Annual Report, excerpted below, the Association detailed its expanding list of concerns. All these matters are entirely feasible and will be done when the public realizes the wisdom and economy in doing so. All projects were supported by the Association from membership fees and individual contributions. As the summer population declined and VIA built trails were turned over to Acadia and the Town took over many of the public works duties once performed by the VIA, the Associations membership also dwindled. Today the VIA focuses mostly on its in town parks, the shore path and continues to make sure village aesthetics are upheld to the highest standards. Local interest and support has always been welcomed by the Association. Today, the VIA consists of a small number of concerned citizens “quietly working behind the scenes to keep Bar Harbor beautiful”, just as their far sighted and much revered predecessors did in years past.